Once upon a time, half a decade ago, Jurickson Profar was the consensus No. 1 prospect in baseball. The 20-year-old switch-hitting shortstop had more than held his own as a teenager at Double-A Frisco in 2012 and had received a major-league cup of coffee in September. The following spring, he topped the prospect lists of Baseball America, Baseball Prospectus, ESPN, MLB Pipeline, FanGraphs, and (probably) Cat Fancy. While he spent most of the 2013 season in the majors, a significant shoulder injury and subpar performance in sporadic playing time within the Rangers’ deep infield have prevented him from getting a foothold as an everyday player until this season. Amid what’s mostly been a lost year for the Rangers, the now-25-year-old Profar’s performance has been a bright spot. Not only was it the Rangers’ first triple play since May 20, 2009, according to Stats Inc., it was the first triple play in which the batter wasn’t retired since June 3, 1912, when the Dodgers pulled one off against the Reds. Alas, there is no video available for that one, but the SABR Triple Plays Database describes that one as a 6-2-5-2-4 play, with catcher Otto Miller recording the first two outs, presumably via a forceout at home and then a second runner getting aggressive, and then second baseman John Hummel making the third out. With the two hits, Profar is now batting .253/.336/.461 with 47 extra-base hits, nine steals, and a 112 wRC+ — that while playing in 108 of the Rangers’ 113 games. Remarkably, it’s the first time since Frisco in 2012 that he’s played 100 games at a single stop. He’s been slightly above average against righties (105 wRC+ in 314 plate appearances) and strong against lefties (129 wRC+ in 128 PA). He’s shown off his versatility, making 59 starts at shortstop, 21 at third base, 12 at first base, and eight at second base, playing solidly enough to total 2.6 WAR, which is tied for second on the team. Of course, part of the reason Profar has been featured so prominently is because of the injuries that have taken the wind out of the Rangers’ sails. Elvis Andrus missed more than two months due to a fractured right elbow suffered when he was hit by a pitch on April 11, which cued Profar’s longest stay at shortstop since Frisco. Adrián Beltré’s ongoing left hamstring woes, which have sent him to the DL twice already, with a possible third trip pending, have opened up time for Profar at the hot corner. This probably isn’t the path that either the Curaçao native or the Rangers envisioned, but it’s a significant step forward. 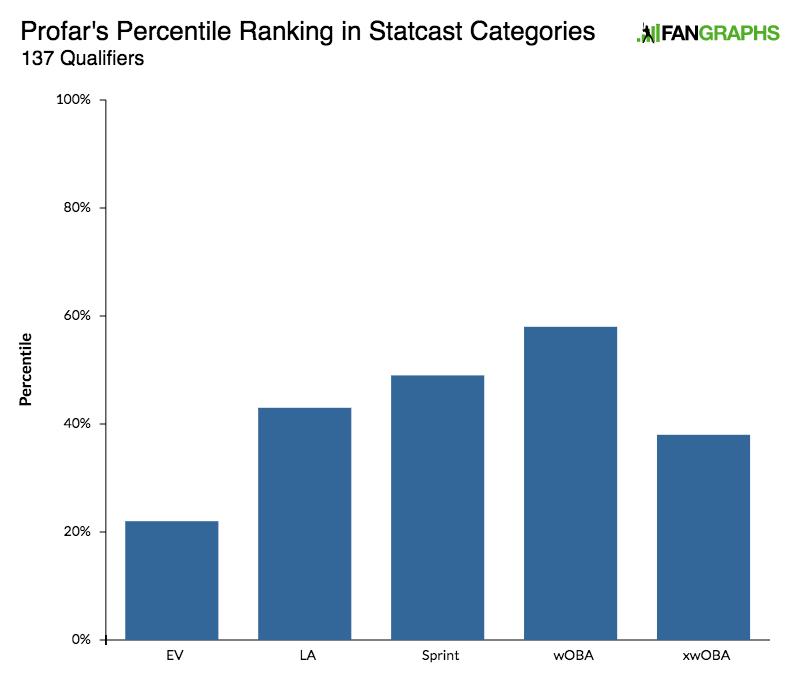 Back in the spring of 2013, Baseball America gushed, “Few prospects represent a safer bet to develop into a first-division regular and All-Star than Profar,” while ESPN’s Keith Law wrote that he offered “an incredible combination of tools, skills, and baseball instincts rarely found in players who play in the middle of the field. His feel for the game is unusual for a player of any age…” The Rangers, coming off three straight postseason appearances, had no vacancy in an infield that featured a 24-year-old Andrus, a 31-year-old Ian Kinsler, and a 34-year-old Beltré, all of whom were under long-term contracts and had been worth at least 2.7 WAR in 2012. After beginning the 2013 season in the minors, Profar was summoned to fill in at second when Kinsler landed on the DL. Between that, occasional off days for Andrus and Beltré, a brief foray in left field, and spot appearances as the DH, he drew 324 plate appearances but hit just .234/.308/.336 (75 wRC+). The November 2013 trade of Kinsler to the Tigers for Prince Fielder appeared to open up second base for Profar, but a torn teres major muscle in his right shoulder wiped out his entire 2014 season, and a subsequent reinjury required surgery in February 2015, limiting him to a 12-game end-of-season minor-league stint and a trip to the Arizona Fall League. With Odor having claimed the second-base job, Profar spent April and May of 2016 reacclimating at Triple-A Round Rock. He reeled off a 13-game hitting streak upon returning to the majors in late May, but he struggled upon assuming a bench role once Odor and Beltré were healthy; his performance (.239/.321/.338, 78 wRC+ in 307 PA) was virtually a carbon copy of 2013. An intriguing stint in the outfield for the Netherlands team in the 2017 World Baseball Classic — a roster featuring Xander Bogaerts, Didi Gregorius, Jonathan Schoop, and Andrelton Simmons — offered some optimism, but after a dreadful April, Profar returned to Round Rock and was summoned for just two brief stints thereafter. He hit an anemic .172/.294/.207 in 70 PA at the major-league level and a modest .287/.383/.428 in 383 PA at Triple-A. One could have been forgiven for jumping off the bandwagon by this point. Profar himself was said to be unhappy that he wasn’t traded in July or recalled in September — and understandably so, particularly given the horrendous season that Odor turned in (.204/.252/.397, 61 wRC+). Yet the Rangers refused to sell low on Profar, the subject of a thousand If-I-were-GM trades. His lack of minor-league options forced them to keep him in the majors this year, and the aforementioned injuries have turned a planned three or four starts per week into everyday duty. Profar’s 9.0% walk rate and .209 ISO are both well above average, and his 13.5% strikeout rate and 4.5-point strikeout-walk differential are exceptional. His 112 wRC+ is obviously above average, but that lagging .264 BABIP sticks out like a sore thumb. Hmmm, Profar’s 87.0 mph average exit velocity, 12.2-degree average launch angle, .335 xwOBA (that’s .330 versus righties, .345 versus lefties), and 27.5 ft/sec sprint speed stack up much less impressively, in part because he’s hitting a lot of grounders (43.7%) and infield flies (11.1%). His .177 xwOBA on those types of batted balls is in just the seventh percentile, while his .518 xwOBA when he elevates for a line drive or a fly ball is in the 15th percentile. There are successful hitters below him in both rankings (José Ramírez in the former, Gregorius in the latter, with Jed Lowrie just above him), and thankfully, with Profar the whole adds up to more than the sum of the parts, so to speak. All things considered, while he could stand to generate harder contact, it’s still been a very successful season for Profar. Regardless of where they stood in the prospect rankings five years ago, 25-year-old, three-win infielders don’t grow on trees. Profar has two more years of arbitration eligibility remaining, and it remains to be seen where the Rangers go with him from here. Andrus has the first of two opt-outs ahead of him this winter, though improving upon the four years and $58 million he’s guaranteed heading into his age-30 season might be tough given the regression of his newfound power in the wake of the elbow injury. Beltre, now 39 years old and battling through a rough season (94 wRC+, 0.7 WAR) full of so many starts and stops, is wondering aloud about retirement. How the Rangers play this out should be worth watching — and thankfully, so should Profar, regardless of what happens. We hoped you liked reading Jurickson Profar Has Finally Arrived by Jay Jaffe! Would the Orioles Be Better with Rafael Palmeiro? love seeing him smash the bust label and turn into a 3-4 win player. 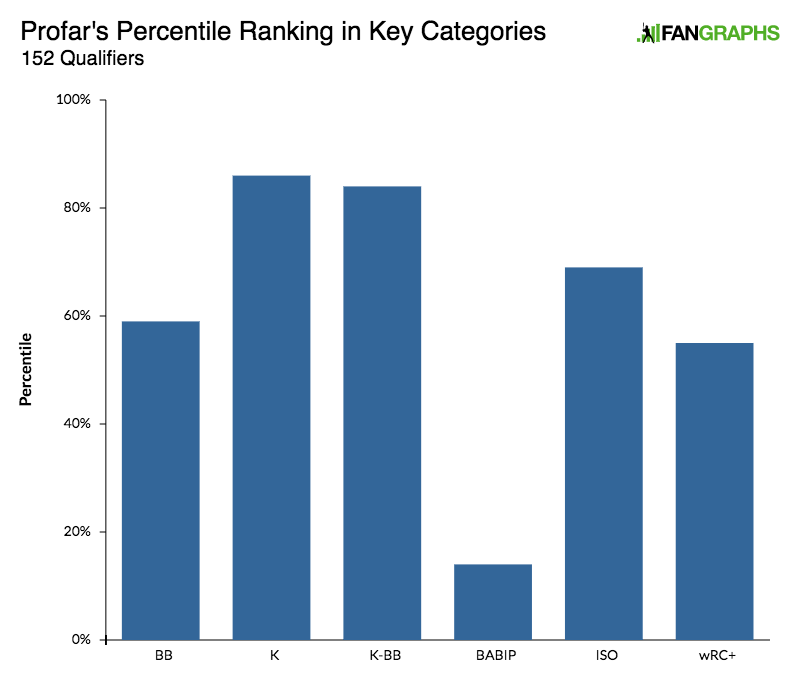 the rangers needed this progress from profar, odor, and gallo. now it’s mazara’s turn to reshape his awful approach and start hitting the ball in the air. He’s hitting the ball harder than he ever has, but it’s all on the ground.